With millions of products, no supplier approval process, automatic uploads and syncs with 20+ ecommerce platforms, it's a match made in dropship heaven. No Application. No Approval Process. 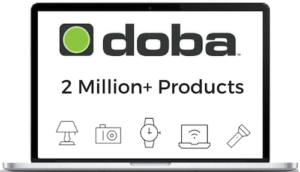 Sign up for a free trial with Doba here and start creating your inventory lists of the products you want to sell online. Create an account with Inventory Source, select Doba as your supplier, and integrate your store. Source millions of products, automatically upload and sync with your store, & start selling online today. Already have a Doba & Inventory Source Account? Login to Inventory Source and select “Doba” as a supplier to get started today!